This theme aims to Reduce waste, increase Reuse, and Recycle as much as possible. It encourages local recycling, water saving, and household composting. It also covers Reskilling (see below). Blewbury benefits from regular refuse services operated by the Vale of White Horse District Council. We are promoting additional schemes to reduce waste and to reuse or recycle. Details of refuse services, what can be recycled and where, can be found on the main Blewbury website under Refuse Services, or visit the Vale of White Horse District Council's rubbish and recycling section. 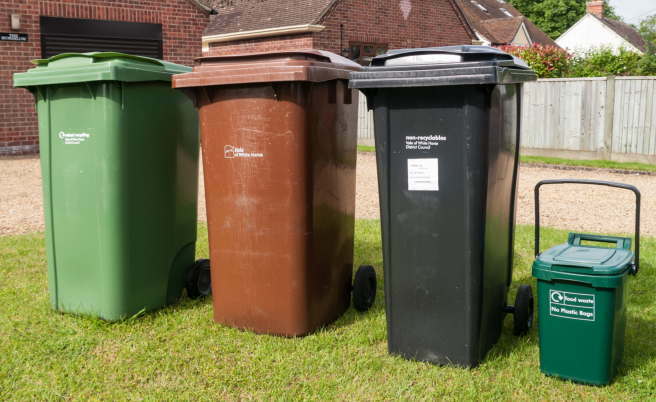 Each household has two or three wheelie bins (the brown one for garden waste is an extra service for a small fee) plus a small food caddy, except for people with inconvenient access who must use bags. Blewbury and Upton collection is normally on Tuesdays, with rubbish and recycling wheelie bins emptied on alternate weeks and food bins emptied every week. There is more information about the arrangements on the Vale website. Batteries: Shops selling batteries in large quantities must have a bin for recycling used batteries. However, you can also put them out with your green recycling bin, in a separate, small bag on top of the bin. For more information on safe disposal, and why you should be using rechargeables wherever possible, see our page on recycling batteries and using rechargeables. Electrical items: It’s now easier to recycle small electrical items. Things like toasters, kettles, irons, hairdryers, small electronic toys, and radios can be placed in a carrier bag and put out next to your grey waste bin. Textiles: Unusable items like torn or worn out clothes, curtains and bedsheets that aren’t good enough for charity can be placed in a tied carrier bag next to your green bin on recycling days. Avoid giving valuable rubbish to landfill! Composting is an inexpensive natural process that transforms kitchen and other household waste into valuable food for the garden. Compost needs a good balance between GREEN (soft plant material) and BROWN (woody and fibrous material). IN: tea bags, grass cuttings, vegetable peelings, salad leaves, fruit scraps, old flowers, bedding plants, coffee grounds, rhubarb leaves, weeds. egg shells, egg boxes, cereal boxes, corrugated cardboard, toilet rolls, garden prunings, hedge clippings, straw, hay, vegetarian pets' bedding, wood ashes, sawdust, wool, natural fibres, feathers, vacuum bag contents, tissues, paper towels, napkins, shredded documents. OUT (do not compost! ): cooked vegetables, meat, dairy produce, diseased plants, dog poo, cat litter, babies' nappies. We often dispose of things we no longer have a use for, even though they still work or could be repaired easily. Don't throw them away – give them to a charity shop. This is a great way to recycle unwanted items, and the money raised can support many excellent causes. Not all of the shops can take every item listed and sometimes they cannot take any donations at all, so be sure to ring before you bring. There are various local facilities that allow you to advertise things you no longer need for some to reuse for free – the Blewbury Bulletin and via Facebook. We have background information on Blewbury’s local water resources on a separate page. Global warming is likely to lead to less predictable rainfall in our area. Water costs are going to increase in line with energy prices. In view of last year’s drought conditions, now (despite all the rain!) is a good time to think about how we can conserve water in the home and garden. We have an interesting graphic on saving water in the home (courtesy of bathshop321.com). Turn off tap while brushing teeth (running taps wastes over six litres per minute). Purchase a dual-flush toilet or install an inexpensive conversion kit. Use a full load in washing machines and dishwashers. Use a shower regulator (in certain types of shower). 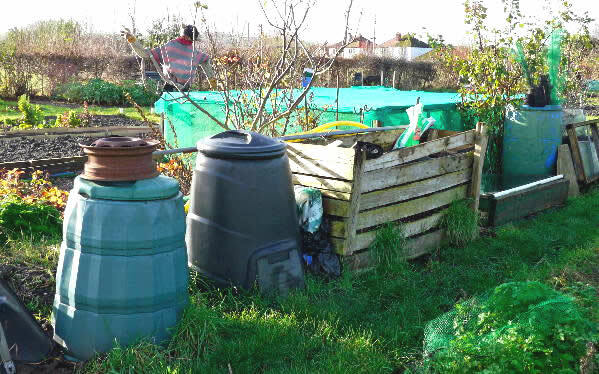 Invest in a rainwater tank. Or on a smaller scale, water butts. 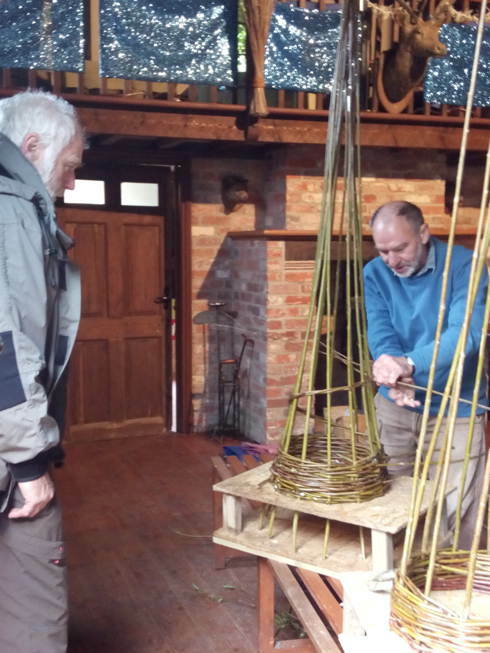 Willow basket and hurdle making was an ancient and essential rural craft in the Downland areas. 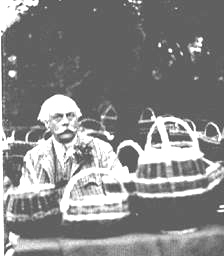 The old photograph below shows Kenneth Grahame with locally made apple baskets in Blewbury. 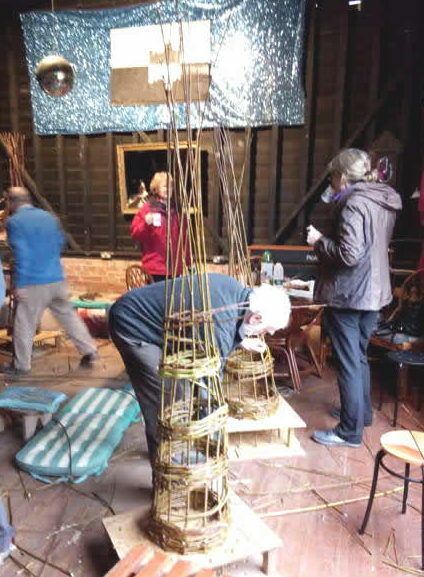 This craft workshop was organised by Kathy Edmunds and led by her cousin Lawrence Graham, a craftsman from north Norfolk. 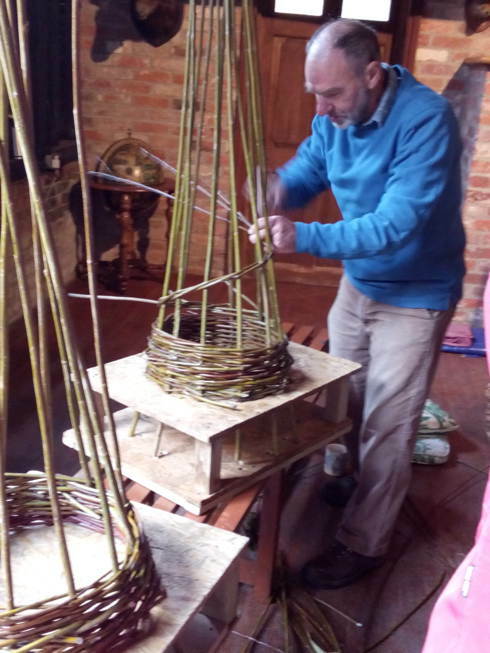 Lawrence had already paid a visit to Blewbury in 2012 to lead work on a willow shelter on our Permaculture site. The materials were provided from sources in Norfolk, but our local green ‘crack’ willow also proved excellent for craft work in the past. After the workshop there was a new planting of willow on local allotments. The pictures show various stages in the making of garden ‘obelisks’. The next workshop will be on basket making.